A simple 19th-century house in eastern Maryland once served as a major stopping place along the Underground Railroad. The “railroad” was an informal path that helped escaped slaves reach free states before the American Civil War. Today, the house is open to visitors. Many who visit it are brought to tears, as they stand before a path where slaves once made their way to freedom. Michael McCrea shows where people have come to touch his house, the former home of Jacob and Hannah Leverton, once a key stopping point for slaves seeking sanctuary on the Underground Railroad in Preston, Md. "They just can't believe that it's here," he said. The Jacob and Hannah Leverton house is one of 36 sites along the Harriet Tubman Underground Railroad Byway, a 200-kilometer self-guided path. The byway is named for Harriet Tubman. She escaped slavery and became a leading abolitionist -- an anti-slavery activist. She guided other escaped slaves north on the Underground Railroad. Tubman also served as a Union spy during the Civil War. 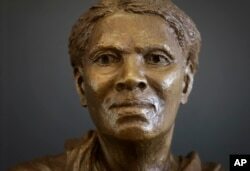 A bust of Harriet Tubman stands in the Harriet Tubman Underground Railroad Visitor Center. 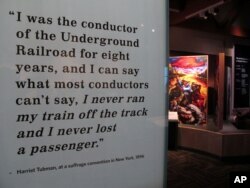 A new $21 million visitors’ center along the byway tells about Tubman’s life. Kate Larson is an historian who has written books about Tubman’s life. She worked as a consultant on the byway project. Larson told the Associated Press that many kinds of people can relate to Tubman’s life and struggles. “It’s hard to identify with George Washington, unless you’re an older white male. But when it comes to Tubman, there’s so many ways that people of all backgrounds and races ... can find something that they can see in themselves that she has carried forward,” Larson said. The places and landscapes along the Tubman Byway offer a rich look into Tubman’s life and the experiences of slaves along the Underground Railroad. After 18 years of planning, the first sites along the byway were announced in 2013. That year marked the 100th anniversary of Tubman’s death. Victoria Jackson-Stanley is the mayor of Cambridge, Maryland. The town is not far from where Tubman was born and raised as a slave. Jackson-Stanley is its first black woman mayor. Mayor Victoria Jackson-Stanley poses for a photograph outside the Dorchester County Courthouse in Cambridge, Md., a stop on the Harriet Tubman Underground Railroad Byway. Harriet Tubman has received a lot of attention in recent months for reasons other than the new visitors’ center. The U.S. Treasury Department announced last year that Tubman is set to appear on the redesigned $20 bill. No woman has been on U.S. paper money in the last 100 years. 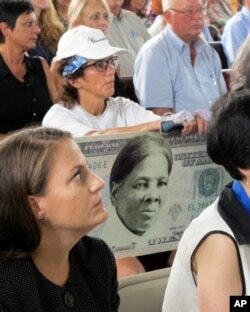 A woman holds a sign supporting Harriet Tubman for the $20 bill during a town hall meeting at the Women's Rights National Historical Park in Seneca Falls, N.Y.
Tubman’s story was recently presented on the show “Underground,” a television drama about the Underground Railroad. Actress Aisha Hinds played Tubman in the show. She said she feels Tubman’s story is a meaningful one in today’s divided America. The site of Tubman’s first known act of defiance against slavery is one of the most popular stops on the Tubman byway. The Bucktown Village Store has been restored at a crossroads believed to be where Tubman refused a slave owner’s orders to help him detain another slave. 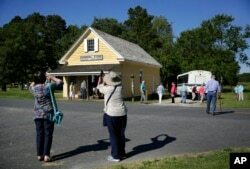 Tourists photograph the Bucktown Village Store, a rural store building that has been restored on the spot believed to be where Harriet Tubman refused a slave owner's orders to help him detain a fellow slave, in Bucktown, Md. When that other slave ran, the owner grabbed a one-kilogram weight and threw it at him. The weight struck Tubman on the head and caused an injury that would trouble her for the rest of her life. The inside of the store still looks like a 19th-century shop. The owners have some Tubman-related objects, including a newspaper advertising a reward for Tubman and two of her brothers. Susan Meredith and her husband own the store. She said more and more people have been stopping at the store since the opening of the visitors’ center. “We see people from all over the world that come to see and step in the place that she was in,” Meredith said. The Associated Press reported this story. Ashley Thompson adapted it for Learning English. Mario Ritter was the editor.